Yesterday I headed to London to run a LazyTown Sports Club activity at a School and Church May Fair prior to Sportacus’ arrival. The children had lots of fun and lots of Sports Candy was eaten. Tomorrow I am off to meet lots of Children at St Peter’s Eaton Square School and Church May Fair, 119 Eaton Square, SW1W 9AL. 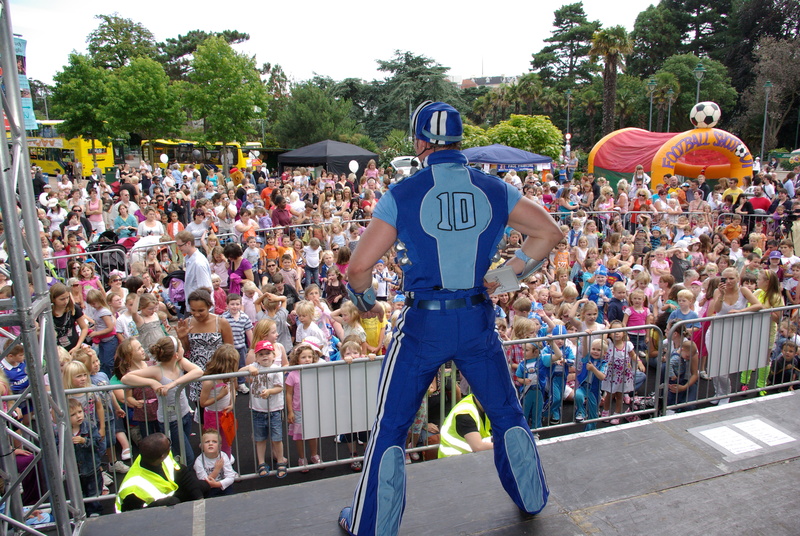 I will be getting the children jumping around with the moves from The LazyTown Sports Club prior to Sportacus’* arrival. The children are in for a great treat with a special performance from Sportacus* and will be able to show him his special moves they have learnt prior to his arrival. This is a not to be missed event, so come on down, jump around with the LazyTown Sports Club powered by FitKid and Sportacus* and have fun at the May Fayre. I have heard there are some fantastic prizes in the raffle. To find out more about running a FitKid and LazyTown Sports Club franchise in your community, please contact me on nicky@fitkid.co.uk We are actively looking for new franchisees to assist us to encourage children to move more while having fun. It was the day of the Sports Relief mile, We awoke to a lovely sunny day and the children were very excited to be going to London. We were running as The LazyTown Sports Club Team to show our support for charity. The children were excited to be seeing Sportacus to show him the moves they have been learning at the LazyTown Sports Club powered by FitKid. We started the journey in the car and then transferred to the train for the last bit of the journey. It was very busy in London, with lots of excitement for Sports relief. However just before we started the run I received a message from Sportacus that a volcano had erupted in Iceland and he had to go and help to ensure everyone was ok. Sadly it also meant he would not be able to make it to Sports Relief in London as once he had ensured everyone was ok, the airspace above Iceland was closed due to the volcano and he was unable to fly his airship out of LazyTown. But well done to Sportacus for helping everyone to ensure they were ok. I hope Robbie rotten wasnt up to his tricks again. He was very sad to be unable to make the run but I have told him everyone had a great time and lots of money was raised for charity and that is the most important part of this special day. The children loved their medals and goodie bags. To everyone who ran for Sports Relief, congratulations and well done to you all.